IMPORTANT: The Competition Series package is designed to fall within the minimum allowed modifications of the various shooting sports. However, some of the options may change the status of the pistol in regards to competition legality. It is the customer’s responsibility to know how this package and any upgrades will effect the pistol’s status in relation to the rules. Please know the rules of your sport, and double check with a sport official/range officer to make sure that the alterations you are ordering will be acceptable in the division/class of any match you anticipate using it. Boresight Solutions has provided the below information simply as a guide, and this information is not to be considered an official ruling/interpretation. Boresight Solutions is not responsible for any errors on our part in interpreting the rules, nor are we responsible for any changes to the rules which change your pistol’s classification which are not reflected on our website. Boresight Solutions is not responsible for customer misinterpretation or misunderstanding of any data provided herein.DO NOT CONTACT US FOR CLARIFICATION OF THE COMPETITION RULES, AS WE ARE NOT AN AUTHORITY. Note: Competition Series is not legal in SSP but is legal in ESP, CCP, CDP and BUG as long as the gun meets size and caliber dimensions for each division. *Boresight Solutions would like to thank the following competition shooters/range officers for their assistance compiling rules/regs data, and their input on how the Competition Package should be configured to deliver maximum utility within the parameters of the respective sports/diviisions. Marc Santos. John Lauer. Matt Olinchak. Nate Perry. John Vlieger. Hunter Osborne. Scott Jedlinski. Please make a selection below, this duty series package does not include a firearm. If need to purchase one please choose an option below or select that you will provide your own. Please note all below GLOCKS are black only. Call for other color availability. Reduces and reprofiles the prominent backstrap hump in the lower 1/3 of the grip. 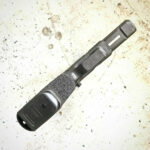 Eliminates the backstrap hump in the lower 1/3, and makes for a much smaller diameter grip. Also makes the pistol point flatter on target, like a 1911. This reduction is ideal for anyone with small hands or short fingers, or who wants a flatter indexing GLOCK. For shooters who want the longer sight radius and barrel velocity of a fullsize pistol, but with a more concealable grip size of a compact. 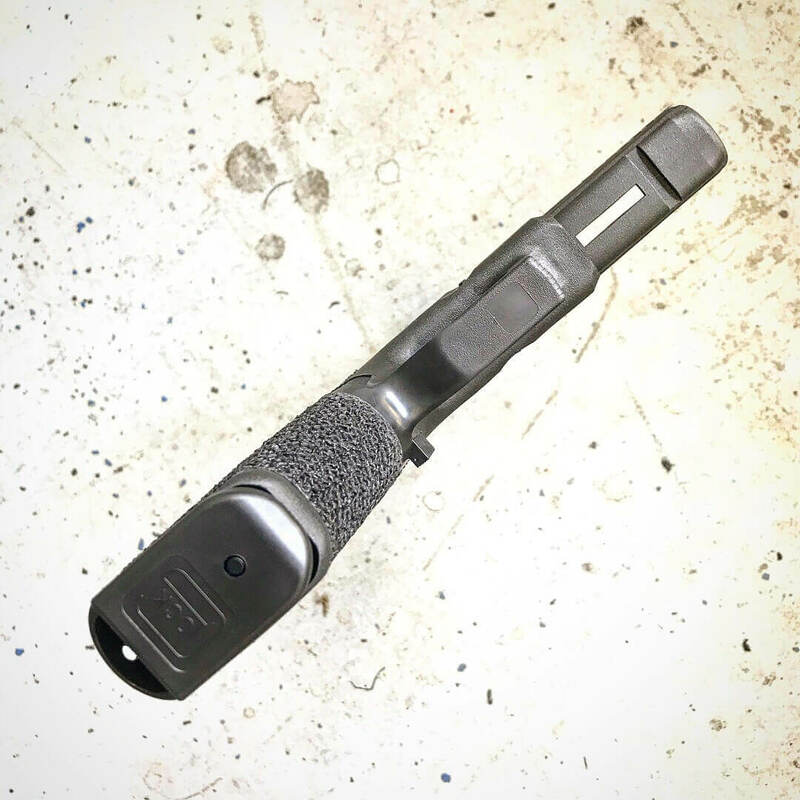 This modification is not simply cutting the grip off so it accepts magazines from the next smaller model.with the SGM, we strive to replicate the profile and features of the model it's being sized after in every way. When applicable, this includes the half-moon cutout at the inside rear of the magwell, relocating the rear lanyard hole properly upward, reshaping the backstrap profile for proper ergonomics, and creating a finger lip at the bottom of the frontstrap. While our method is very labor intensive, the resulting details and profile look and feel so similar that oftentimes people won't realize that they are handling a frame that's been cut down from a larger size unless the slide is on it. Same as the SGM1 listed above, just more time-consuming due to added dimensions of those models..
Tactical reference points on the forward right and left of the frame. We recess the texture into the frame. 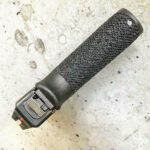 This provides two levels of tactile reference (the recess and texture) and also protects the texture from holster wear. Deep, sculpted secondary undercut on the bottom of the trigger guard for consistent support hand placement and enhanced support hand leverage. 5) APEX AET/Ghost Pro fitted/polished trigger job. 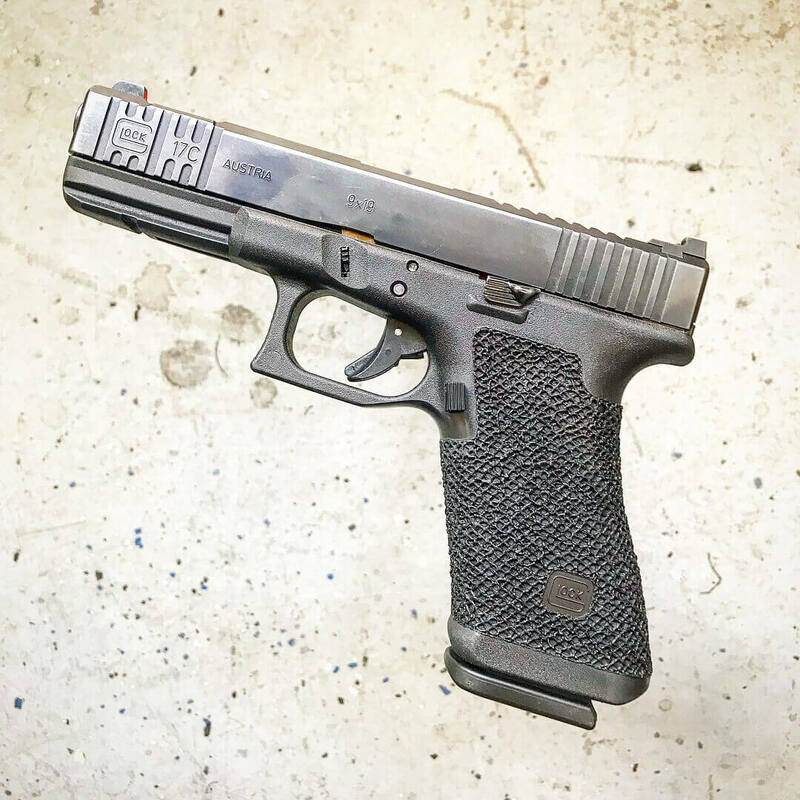 GLOCK 43 only. $175. 6) Ghost Evo fitted/polished trigger job (retains factory trigger shoe): $145 for gen 1-3. Not compatible or needed with a level 2 reduction. Do not choose if you would like to add a magwell. This modification, developed at the request of our friend Hilton Yam of 10-8 Performance for duty use, provides a permanent/integral magazine loading ramp at the back of the magwell, while also retaining the use of the OEM lanyard attachment point. Will not work with bolt-on magwells, but is a great option to combine with URMOM (below). Same as 10-8SR, but without the lanyard feature. 1. URMOM - $55 - Universal Reprofiled Magwell Opening Modification. The frame magwell opening is flared out to provide the benefit of a bolt on magwell, without the added bulk. 3. Raven Concealment "Freya" magwell - $95 - Gen 3 &amp; 4 19 size guns, and gen 3 17 size only. Please select a Trijicon RMR below. Please note all listed below are Type 2. Please note that this is just the optic, it will not be installed unless you select a slide package that has an RMR cut service. Specify Yellow or Orange front. Other Sight Installation: call for information and pricing. Add serrated slide plate to fill RMR fooprint when RMR isn’t installed. Made of tool steel and black nitride. Omit the logo engraving. Recessed logo panel will remain. This step is required to place an order. Please read the below information and type the corresponding information below. 1. Please read the waiver for service (Click Here For Waiver). Once you have read the document please type your full legal name as it appears on your drivers license, we will accept this as your formal signature. 2. If you will be sending a firearm in for work please type your serial number below exactly as it appears on your firearm, Please remember to include a copy of your drivers license and a copy of your E-Mailed receipt with the shipped firearm. 3. Our lead time for Signature Series packages is about 8 months. Our lead time for Duty Series Packages is roughly 6-8 weeks for frame work and 2.5 to 3 months for frame and slide packages. If you are concerned about lead time please call as we may have some of these options ready to ship immediately. If you have called to confirm lead time or you are ok with the quoted time frame please type "YES" below. 4. Deposit - To help our customers out we offer the ability to pay for 50% up front and the remaining 50% once the firearm is completed and ready to ship back to you. If you would like to put a 50% deposit on your order please enter DEPOSIT in the coupon field during checkout to reduce the balance due today by 50%. This is not a discount, it simply allows you to pay for the second half once the gun is ready. Once completed we will call you for any balance due. Competition Series GLOCK Grip Package Includes…. 360 degree mild smoothing to blend panels, edges, and the factory texture and establish a uniform flat surface. Grip profile remains stock. Finger grooves are removed and the front-strap is reinforced to retain structural integrity (gen 3-4). Leaving finger grooves in place is optional. Trigger guard/frame juncture is undercut and polished to provide a higher grip and eliminate” GLOCK knuckle”. Grip receives 360 degree texture in your choice of sharpness. NOTE: Texture footprint is the same as our Duty Series layout, BUT features a textured border, instead of our traditional hand cut edge lines that are standard in the Duty and Signature Series. Hand cut edge lines are available in this package as an upgrade option. 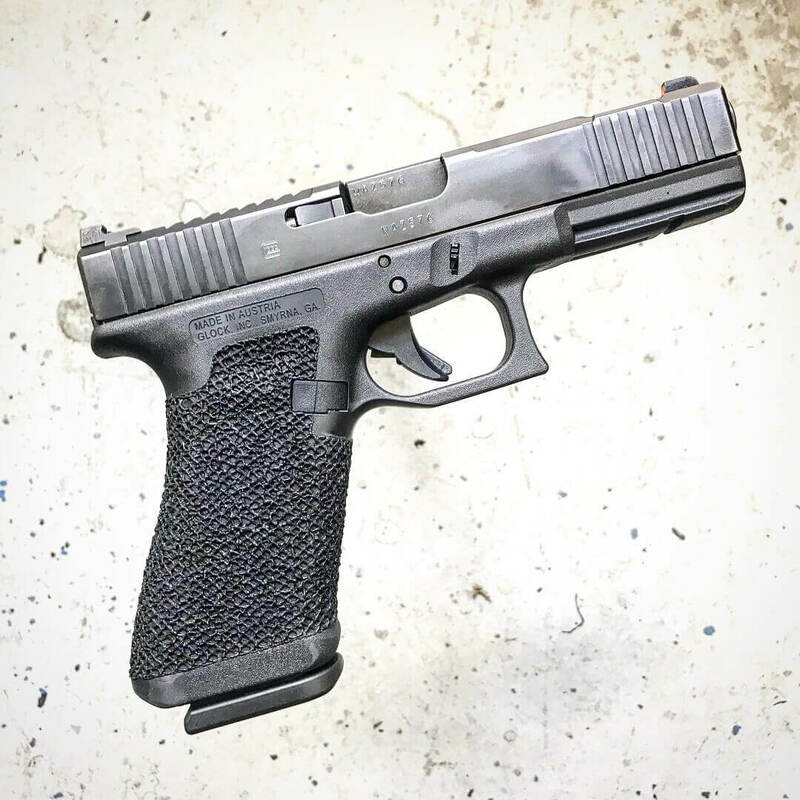 The standard GLOCK package will accept a magwell or grip plug, and while the bottom texture border is designed to line up specifically with the Freya magwell from Raven Concealment, the edge line should be high enough that the texture near the base of the grip doesn’t end up underneath any magwell with reasonable dimensions. Some magwells take up more space on the grip than necessary, so we recommend not using a magwell that extends so high that it covers the texture. Adding a Level 1.5 or 2 reduction will negate the use of a magwell or grip plug.